With the possible exception of organists, the art of improvisation is practically a lost art amongst classical musicians today. “Playing what the composer wrote” is the current mantra for so-called “serious” musicians, but this approach to a performance is often more of a hindrance than a key to illumination of a piece. We had a good example of exactly this in Austin last weekend. Venezuelan pianist Gabriela Montero (photo: right) is renowned for her ability to improvise and with the Austin Symphony (ASO), she showed just how liberating that art can be. Mozart himself was undoubtedly one of the greatest improvisers of all time and in his piano concertos, he provided myriad opportunities for soloists to strut their stuff! For example, Mozart composed no cadenzas for the d minor concerto. Cadenzas for the piece, written by Beethoven and Brahms, among others, do exist, but the spirit of the music calls out for a soloist who can – on the spot – concoct his or her own cadenza from the concerto’s themes. Gabriela Montero did just that, with flair and imagination. This evening’s concert was performed twice in Austin and I am told that Montero’s improvisations for the Mozart d minor concerto were quite different – and equally brilliant - each night. That said, it was not only Montero’s improvisations that made this Mozart performance memorable; in fact, just about everything about this performance was superlative. Montero’s tempi were on the quick side, providing an edge to the performance that was totally compelling. Peter Bay and his orchestra were clearly inspired by Montero to give their very best and delivered a collaboration that was both crisp and intense. The audience knew immediately that it had witnessed a great performance and demanded more from Montero, who gladly obliged and swung into her patented encore routine. She grabbed a microphone and asked the audience to give her a tune to use for improvisation, and she asked that it have a local character. Apparently, the audience responded both nights with the same request: “The Eyes of Texas,” a song associated with the University of Texas in Austin and its football team, the Longhorns. On this night, Montero turned the tune upside down and inside out and ended with a tango version that brought the audience to its feet once again. Gabriela Montero made her Austin debut with these concerts, but I suspect it won’t be long before she is back again. After intermission came the ASO’s recognition of the 150th anniversary of the birth of Richard Strauss. The orchestra more than doubled in size and delivered a powerful and exciting performance of Also Sprach Zarathustra. The Long Center has no organ, but an electronic substitute proved more than adequate. Brass and percussion played the opening “Sunrise” section – C major chords in Technicolor - with full force, and the hall resounded. Some of the most memorable moments in this performance were in the quieter parts - for example, the double basses at the beginning of the fugal section titled “Von der Wissenschaft” (“Of science”); extraordinarily difficult to play in tune, the ASO basses (and cellos) showed that they had put in the time to get it right. Some audience members may have wondered what several of the bass players were doing in the middle of the “Wissenschaft” passage when they appeared to be tuning their instruments. The explanation is that American bass players use four-stringed instruments or which the lowest note on the lowest string is “E,” yet many composers often wrote bass parts that went lower, down to “C”. In many European orchestras, this is no problem because they use 5-string instruments and the lowest string covers these lower notes. Then, some years back, a clever American player came up with a solution – i.e., to attach a mechanism to the instrument that enables the player to lengthen his E string when the music requires it, thus enabling him/her to play the lower “C”, for example. In fact, what some of the ASO players were doing when they seemed to be tuning their instruments was exactly that - activating or de-activating these C-extensions. Richard Strauss’ Also Sprach Zarathustra may not make much sense as an interpretation of Nietzsche, but it is nevertheless one of the most glorious examples of romantic orchestral music. Apart from some minor and perhaps inevitable mishaps in this demanding work, the expanded ASO delivered the goods; the string players really dug into the strings and the brass and percussion were encouraged to go all out in the climaxes. An inspiring finale to another fine season by the Austin Symphony and music director Peter Bay! Earlier in the concert, Maestro Bay had introduced us to Dark Mountains by American composer Robert Paterson. Written for and premiered by the Vermont Symphony in 2011, the piece attempts to depict various aspects of the green mountains of Vermont. In spite of the composer’s rock music background, the music sounded patently old school classical – pleasant, if not fresh and illuminating. If Paterson has something original to say, one didn’t find it in Dark Mountains, but perhaps one will in his upcoming trilogy of “R-rated” (his own words) operas for the Fort Worth Opera. For this ASO concert, I sat in the Balcony - the top tier of the Dell Hall of the Long Center. I had never sat there before and I was amazed at the presence and clarity of the sound, not only of the enlarged orchestra for the Strauss, but also of the Mozart chamber orchestra. This phenomenon, of course, is true in halls all over the world. In Massey Hall (Toronto, Canada), for example, although the orchestra appears a long way away off to those sitting in the top tier (Gallery), the sound is magnificent. From this perspective the “cheap seats” are often the best seats. The ASO is still trying to figure out how best to work the acoustics in the still fairly new Dell Hall. It takes time to figure these things out, a difficult task for a conductor when limited rehearsal time deprives him of the luxury of sitting in the hall periodically to hear what the audience hears. 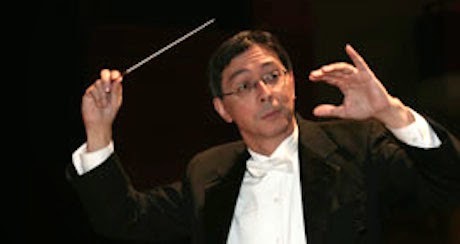 With its limited budget, the ASO has very few guest conductors, allowing Peter Bay even fewer opportunities to hear what his orchestra sounds like out front. Maestro Bay was obviously deeply impressed by what he heard when the Cleveland Orchestra made a rare appearance recently in Austin’s Dell Hall. The Cleveland Orchestra would probably make a fantastic sound regardless of how they are seated on the stage, but their seating arrangement did give Bay some food for thought. For this performance, Bay switched to the Cleveland Orchestra configuration for his violas and cellos – placing the violas to his right on the outside with the cellos still on his right, but inside the violas. Bay also did away with risers, placing nearly all the musicians’ chairs directly on the floor of the stage – another Cleveland Orchestra practice. My recollection is that the Cleveland Orchestra has used this configuration as far back as the George Szell era (1946-1970) and it may, at least in part, explain the near-perfect balance this ensemble achieves so often. To learn more about Gabriel Montero visit her website at www.gabrielmontero.com. You will find there information about her recordings and about her upcoming appearances. Scheduled dates include performances with the Boston Symphony at Tanglewood this summer, and with the Houston Symphony in September.